It seems only appropriate that this well made Double Edge razor gets part of its name from Seki, an area in Japan known for making some of the finest blades in the world. Designed to be used with razor blades, this Seki Edge As-D2 DE razor is designed for the precision shaving of even the toughest beards. 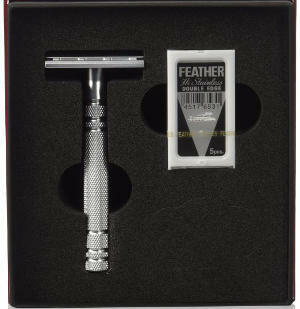 New Model replacing the previous AS-D2 feather razor. Comfortable grip handle helps to keep the razor from slipping in or from your hand during use. Superb craftsmanship goes into every one of these razors. Let us say up front that this is an extremely expensive DE razor. When most high end Double Edge razors sell for about half the price of this razor, the excellent quality and craftsmanship of the Seki speak by themselves. Just to clear up some confusion, AS-D2 is the new model from an earlier version known as D1. The handle of this razor is 3.5 inches long and the texture on the handle gives you a nice grip without any slippage. It comes in a nice box with a pack of feather blades and can be a great gift for holiday season or any other occasion. Consumers feel they are getting a real deal when they purchase this razor, and the ratings and reviews for the AS-D2 simply couldn’t get much better. Durability and Quality: Users are thrilled with its durability and quality. Instead of chrome plated metal, it is made of pure stainless steel making it able to withstand rust. It is actually made with such concern for quality that even young men who have purchased this razor are sure it will be the only the DE they will ever need to purchase. Smooth Shave: Most users agree that this is more than just a razor. It is actually a precision made instrument that gives them an incredibly close shave with less irritation they could ever have believed possible. The fact that it is well balanced only adds to users´ comfort when using it. Classic Yet Modern Design: Users like the fact that this is also a great looking razor having a classic yet modern design that makes it stand head and shoulders above other high end razors.